Rafael Soldi: I met you when you entered art school as a painter. Now you practice primarily as a curator and arts organizer. When did this shift happen and how is your curatorial practice like/unlike an art practice? 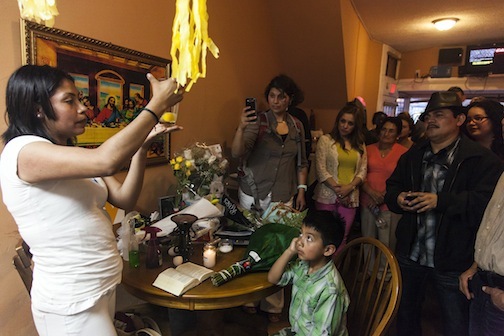 Michelle Ivette Gomez: I have been making art my whole life and curating exhibitions since I was 18 years old. The curating started when a high school teacher said I would be good at curating and offered me an opportunity to do it. I had no idea what that word even meant, so I looked it up on Wikipedia on the classroom computer and immediately fell in love. That’s when I had the opportunity to curate my first show called “Young Blood” which featured the works of my fellow classmates in a furniture and home design boutique in my hometown of Miami, FL. After that show, I continued curating annual exhibitions called “Young Blood” for New Word School of the Arts alumni for about 6-7 years in collaboration with other alumni like Patty Suau, John Witty, and Danae Aguirre, while spending time between Miami and Baltimore, and studying General Fine Arts and Curatorial Studies at the Maryland Institute College of Art (MICA). I was questioning who these exhibitions were for. I knew I wanted to take my curatorial practice to the next level after having studied with George Ciscle and learning about his work with one of my art/curatorial heroes, Fred Wilson in the 1989 show, “Mining the Museum”, which attempted to critique the museum from within by mining the Maryland Historical Society’s collection to highlight the history of Black people and Natives in Maryland. Here’s a great Bmore Art article about how this show changed the art world! After looking into graduate programs on the West Coast, I was conflicted as to whether or not I should stay in Baltimore. George Ciscle then asked me, “Who is your community”? Right then and there, I realized that Baltimore was my second home. I decided to stay in Baltimore to attend MICA’s new MFA in Curatorial Practice (CPMFA) program in order transform my curatorial practice into a more socially relevant path beyond the traditional practices you find in the white gallery cube. RS: After completing your MFA in curatorial practice you produced a series of projects in Baltimore that focused on collaborating with underrepresented communities. Can you elaborate on these? MG: During my time in the CPMFA program, I was coming to terms with my identity. Since then, I have been committed to advocating for arts equity and community representation beyond the elitist and oftentimes white art world. With a longing to challenge the norms of curatorial practice found in arts institutions, I began focusing my graduate studies on organizing exhibitions centered around expressing people’s stories through collaborative and community focused curatorial practice to co-create art exhibitions about socially relevant issues. Estamos Aquí (We Are Here), a guerilla public art project that projected the portraits and stories about Baltimore’s Latino community leaders on the side of a building, and..
Cutz: Black Men in Focus, a photography and video exhibition by artist Gracie Xavier that explored Black Male identity through the lens of the African American barbershop at Gallery CA in Baltimore, MD. RS: When I think of you, I think MIAMI. But you created a home and community for yourself in Baltimore. What brought you back home ? MG: I’m 305 till I die!!!! I oftentimes travel a lot between Baltimore and Miami. I consider both of them my homes although Miami is my original hometown. Living in Baltimore for almost 8 years means that a big chunk of my identity and memories of becoming an adult is based there. I had to make the hard decision to move from Baltimore back home to Miami for many complex reasons related to life after graduation. But more importantly, I needed to reconnect to my cultural roots and ground myself within the city I came from, while figuring out what to do next after having created so many memorable art exhibitions and started so many arts equity initiatives. Why do we put ourselves through so much emotional and physical labor for so little pay while only relying on grants to create feel good exhibitions with no long term sustainable plan once the exhibition is taken down? What does it mean to live in a healthy creative economy where our work is valued and compensated in a non tokenized way? What does it mean to be a curator in the expanding field of curatorial practice? How do I navigate the systemic barriers that women of color face, especially in the arts? How can I make a living doing what I love without relying on traditional definitions of success for curators (ex: working 9-5 in a museum or gallery)? RS: Recently you made a bold career choice and launched Creative Unions LLC, proving that you can mix art and commerce, and retain your identity and integrity as a curator while seeking unique opportunities to make a living. Getting a paycheck is important too. Tell us about Creative Unions LLC. MG: After moving to Miami to reflect on all these experiences and answer all of these questions, I realized that what I loved most about all those exhibitions were the opening receptions, which were essentially events that brought people together to celebrate! (I was also really good at planning and marketing those kind of programs). I then started working in event planning beyond the art world. The skills and values I learned while doing community focused arts organizing work in Baltimore inspired me to continue redefining art’s purpose and expand the way it is presented, via my own business! The business started when my partner and I would talk about out of the box wedding ideas. I’d wonder to myself how I would I approach my own wedding, while questioning society’s expectations of women. My partner would often say, “Knowing you, you would end up curating our wedding”. I thought to myself, why not think of weddings as art exhibitions that utilize art to express love stories in powerfully unique ways traditional weddings cannot express? With all of the positive feedback from my community of artists, arts lovers, and couples in love, I took a leap of faith and started to build Creative Unions Event Design LLC, the first ever event planning company dedicated to integrating contemporary art into weddings and events. RS: Miami is Nice was the first event produced by Creative Unions. It was a multilayered, complex, and undeniably successful event—a wedding with a month-long curatorial program. Tell us about this exquisite queer paradise! 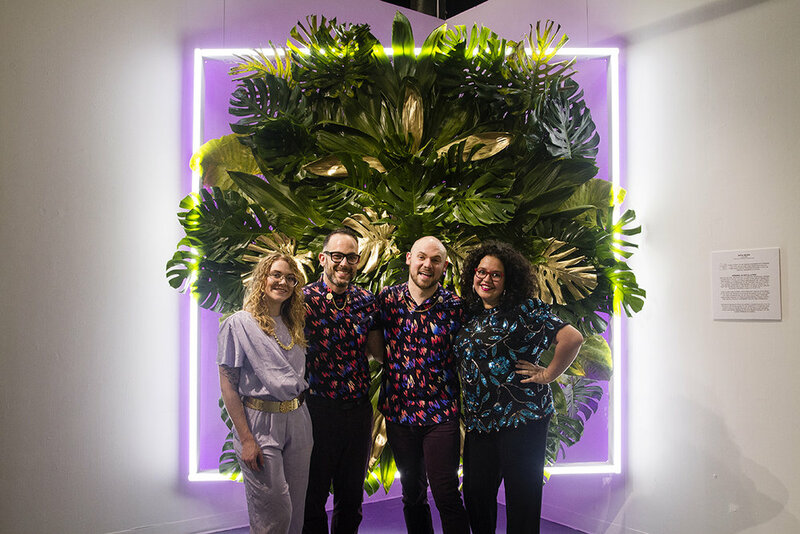 MG: Miami is Nice was a dream to work on with Creative Union’s pioneer couple, Nick and Zach and my curatorial partner and art angel, Carlyn Thomas of Terrault Gallery in Baltimore’s artist run gallery, Spacecamp! 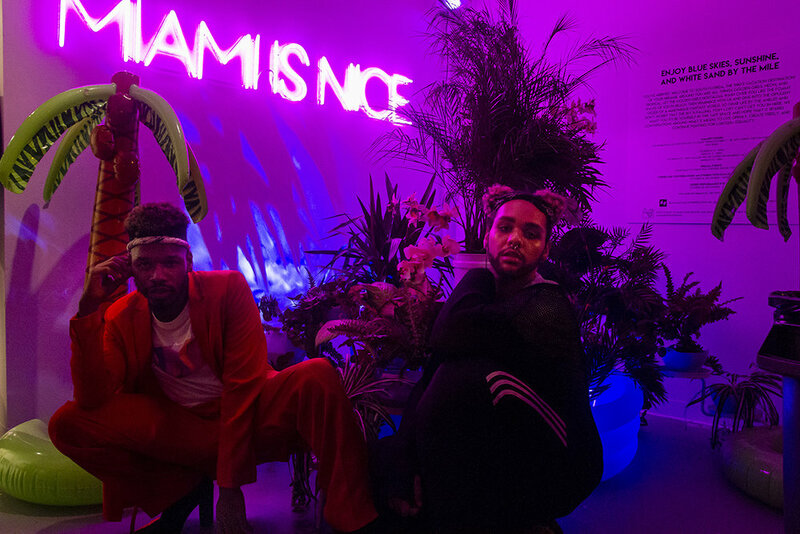 Miami is Nice was a month long group art exhibition, queer performance series, and gay wedding celebration inspired by the hit 1980’s television show The Golden Girls set in tropical South Florida, offering an escape to a queer paradise: a world in which love wins. Miami is Nice took guests to Blanche Devereaux's idealized version of South Florida in the 1980s, a decade primarily known within the queer community for the devastating aftermath of the AIDS crisis and the triumphant acts of perseverance which mobilized a generation to fight for recognition. Utilizing The Golden Girls as a symbol of strength, subversion, and profound acceptance, Miami is Nice continued that fight by offering a joyful, nostalgic, and leisurely escape from the struggles of daily life to an actualized paradise: a world in which love wins. RS: You have a longstanding commitment to issues of social justice, representation and activism in your practice. How did these themes manifest in your curation of Miami is Nice? MG: I think with any client I work with under Creative Unions, I will naturally think about how their story is socially relevant to their community whether it’s for a private event or it’s for the greater community if they choose to share their love story with the world like Nick and Zach did. Those intentions come out of my research which was influenced by my community fieldwork in Baltimore when getting to know strangers on very personal levels. I always ask myself and my clients one of the most important questions everytime I curate: “In order to what?”. If there is no “in order to what?”...then it just becomes an art for art’s sake exhibition, which I feel there is no point in doing given my values around art, its purpose, and its potential for making positive change. When working with Nick and Zach during the early stages of planning, I dug deep into their personal stories to figure out that “in order to what”, which resulted in a show that responded to the U.S. presidential election, and the recent closings of safe queer spaces in Baltimore. Miami is Nice provided a queer paradise to escape from the everyday struggles of being LGBTQIA+. It also provided temporary refuge for members of the community who have been isolated by these events. Utilizing Golden Girls nostalgia, this public exhibition and series of programs provided a safe space for artists and patrons, and spark conversations around what it means to live openly, create freely, and continue fighting for equality with LGBTQIA+ allies and art lovers. I also consulted on best practices for outreach, making sure we amplify the voices of Black artists, and talk about the issues affecting Trans women of color, undocumented queer folks, such as climate change, police brutality and so much more. It must be intersectional AF! RS: What's in the future for you? MG: I am looking forward to growing Creative Unions and excited to book more clients in Miami, Baltimore, and beyond. When I am old, full of “resources”, and totally sick of the art world, I want to study psychology to help artists with their mental well being, do floral arrangements on the side, and share my wealth with other Black and Brown women artpreneurs so they too can take the risk in building and successfully sustaining a creative business. I know I tend to plan way ahead, so I guess I will just start planning this December to ensure my 2018 will be as good as Cardi B’s 2017...making money move, doing what I love, redefining the purpose of art, and curating on my own terms, while supporting artists beyond the nonprofit industrial complex.